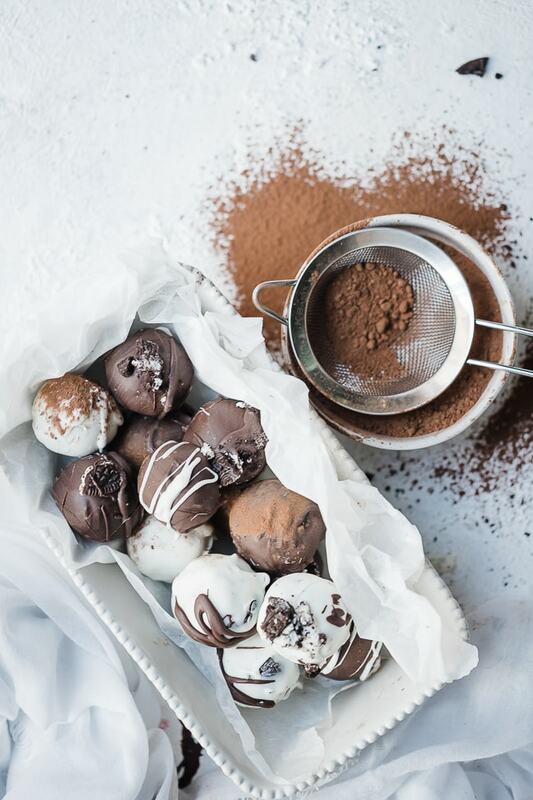 These no-bake chocolate oreo truffles are a rich, indulgent treat that anyone can make. With only 3 ingredients – these truffles can be made in under an hour. Smooth cookies and cream filling, with a hard chocolate shell is heaven in a single bite. Many years ago I was introduced to a little piece of heaven called the Chocolate Oreo Truffle. A friend would make them once a year and sell them at a fundraiser auction. They were always the hot ticket. When I learned how easy they were to make I was shocked! This delicious piece of candy is only a few ingredients!? It couldn’t be! Pro Tip – Confectioners coating can be found in the baking aisle of your grocery store. 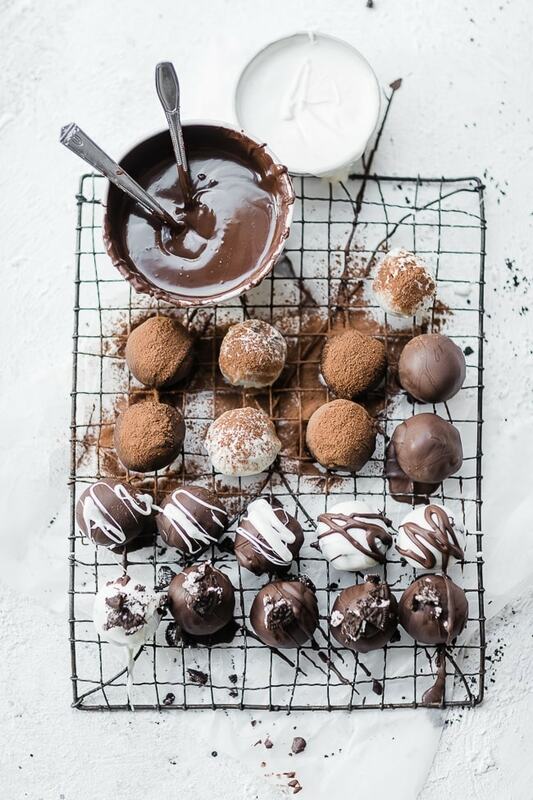 How Do You Make Chocolate Oreo Truffles? Crush your chocolate wafer cookies by blending in a food processor or mixer until it is the texture of dirt. You can alternately place cookies in a large zipper bag and crush with a rolling pin. Cream your cream cheese with a hand or stand mixer until fluffy. Add crushed cookies and mix until well combined. Roll mixture into one inch balls. Place on a baking sheet and freeze for 20 minutes to ensure they are firm. Melt confectioners coating (Candyquick) in the microwave according to the package directions. Usually you heat for 60 seconds, stir, and reheat in 15 second increments until smooth. Dip each chilled ball into the coating and completely cover. Place on a sheet of waxed or parchment paper until coating is hardened. Transfer to an airtight container in the fridge until served. Will keep 10 days. Pro Tip #1 – Leave cream cheese on your counter overnight to ensure is is softened for easy blending. If you forget – simply unwrap the cream cheese, place on a microwave safe plate, and microwave for 15 seconds. 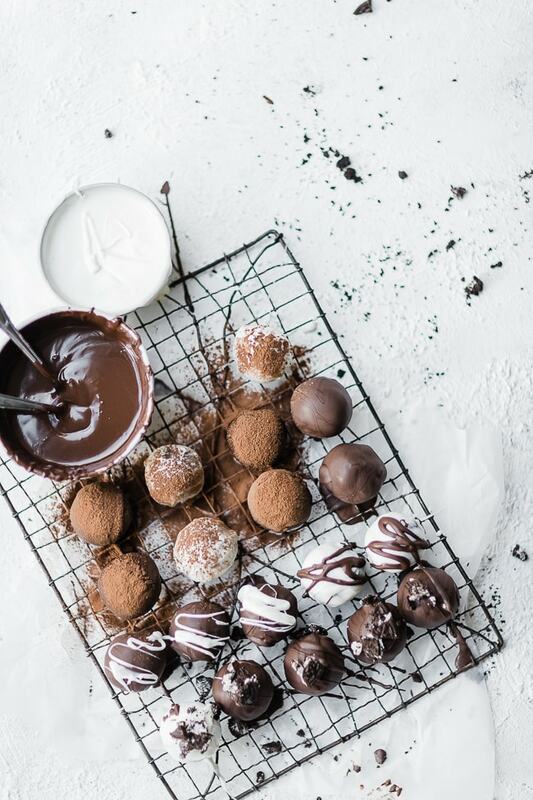 Pro Tip #2 – Use two forks to dip the chilled oreo balls in chocolate coating – this will give you control to completely cover the balls and will also keep your fingers clean. Top with crushed chocolate wafer cookies before the candy coating dries. Top with a drizzle of a contrasting color of confectioners coating. How Do I Store Oreo Truffles? 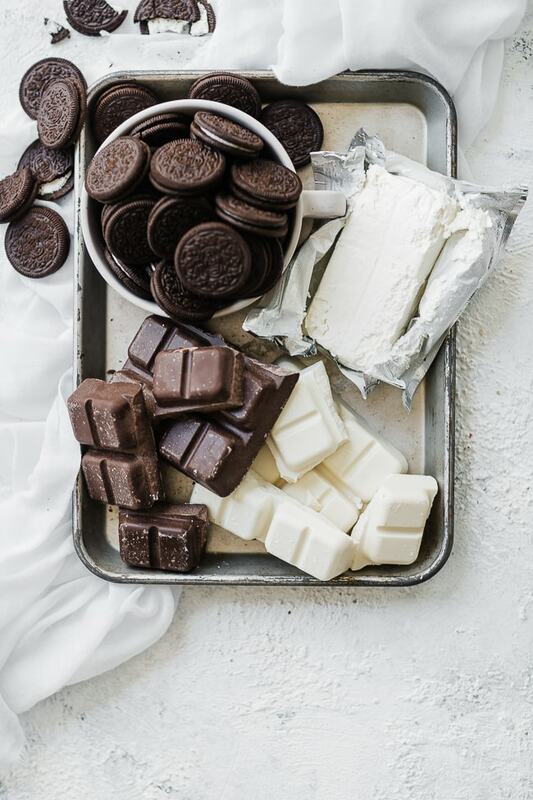 Oreo truffles contain cream cheese, so it is best if you store them in the refrigerator. Place them in an airtight container. Truffles will stay good for 10 days to 2 weeks. But I promise they’ll be eaten before they go bad! 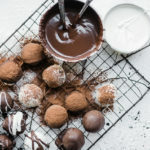 easy and delicious oreo truffles that will be a hit with any party. Using a food processor or blender process oreo cookies until they are the consistency of dirt. Using a hand of stand mixer, mix the cream cheese and oreo crumbs until well combined. Wrap in plastic wrap and chill for 1 hour. For shaped truffles: roll mixture out to about 3/4" thick. Use a 1 inch cookie cutter to cut out shapes. Place on baking sheet and freeze for 20 minutes. For round truffles, roll into 1 inch balls, place on a baking sheet and freeze for 20 minutes. Melt candiquick according to package directions. Coat truffles in candiquick. Place on a sheet of wax paper and let harden. Pro Tip #1 - Leave cream cheese on your counter overnight to ensure is is softened for easy blending. If you forget - simply unwrap the cream cheese, place on a microwave safe plate, and microwave for 15 seconds. 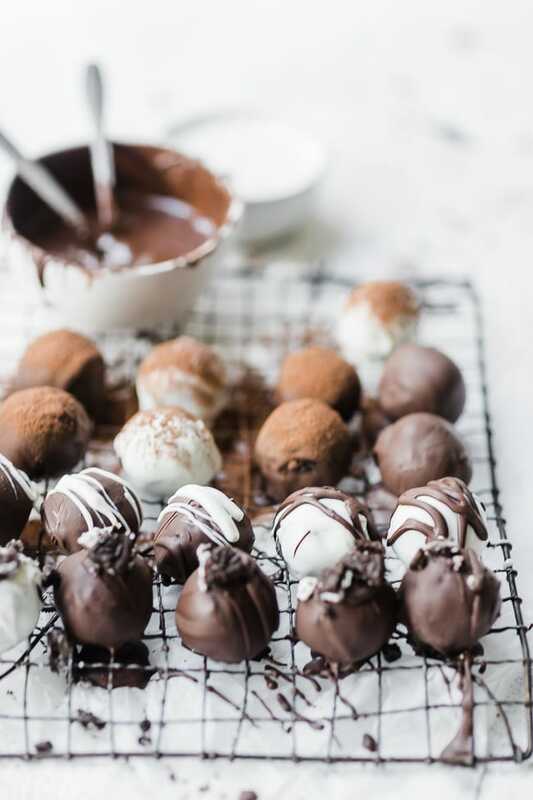 Pro Tip #2 - Use two forks to dip the chilled oreo balls in chocolate coating - this will give you control to completely cover the balls and will also keep your fingers clean. I could seriously eat a whole batch of these all by myself, ugh! They sound so good right now! These look so cute, would be perfect on valentines day!